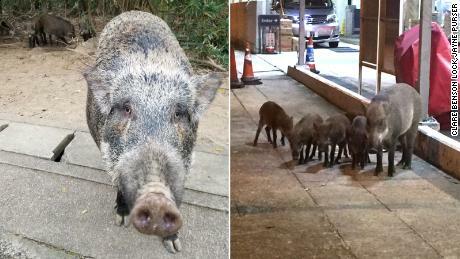 Which high-rise city is being invaded by wild boars? A few weeks ago, the family encountered some unusual neighbors: a trio of wild boars. The boars now regularly wander along the road that leads to the Walsh’s apartment complex, nap in a favored spot beside a nearby footpath and hang out in the local playground. “They’re super tame and friendly,” says Walsh, but adds that she always keeps a watchful eye on them when she has her twins in tow. Encounters like hers are becoming a regular part of Hong Kong city life. The number of boar sighting and nuisance reports has more than doubled in the past five years, according to the Agriculture, Fisheries and Conservation Department (AFCD). The beasts, which can weigh up to 200 kg (440 lbs) and can reach up to 2m (6.5 feet) in length, have recently run amok in Hong Kong’s financial district, roamed among airplanes at Hong Kong International Airport and wreaked havoc in a shopping mall. Hong Kong is renowned for its dense urban areas and dazzling skyscrapers. But less than 25% of its land has been developed, and country parks and nature reserves make up 40% of the territory. Most of the development on Hong Kong Island is confined to a coastal strip. Almost all the development on Hong Kong Island is squeezed into a narrow strip of usable land around its perimeter. For residents here, it is only ever a short step from the concrete jungle to the subtropical rainforest that flourishes on the steep, rocky hills of the interior. Thanks to this, snakes, monkeys and porcupines are all spotted in residential areas. In the 20th century, tigers still prowled parts of Hong Kong, but since they died out, the largest wild animal found here is the boar — a native wild pig. 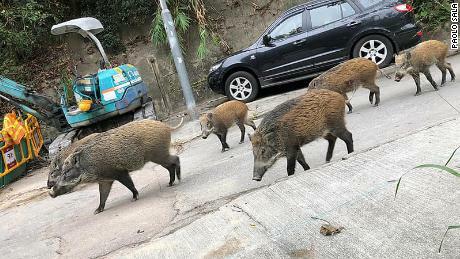 While nobody knows how many boars there are in Hong Kong, a spokesperson for the AFCD said that a survey is planned. What is clear is that the boars — which were once solitary and secretive — are starting to lose their fear of people. Rachel Duffell is a runner who frequently encounters boars on trails near her home in Quarry Bay, an urban district on Hong Kong Island. 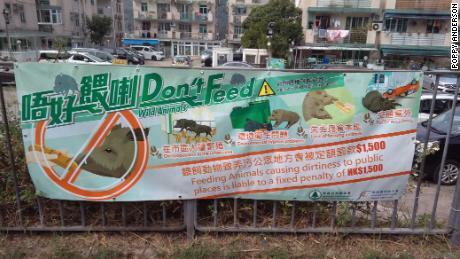 There have been only 10 recorded cases of wild boars injuring people since 2014, according to the AFCD — but half of those incidents occurred last year. 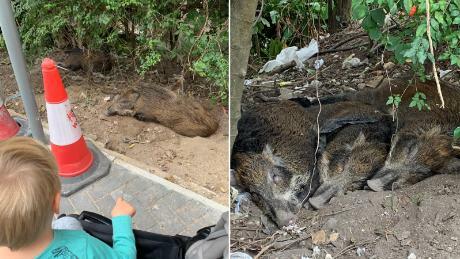 In January this year, the University of Hong Kong warned staff and students to be on their guard following two wild boar attacks near the campus, according to local media. 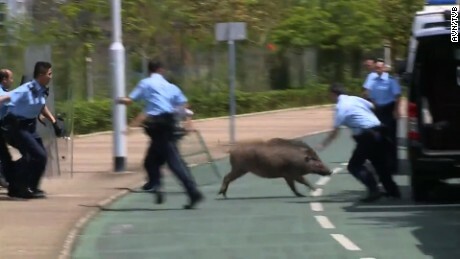 At the end of last year, two senior citizens were rammed and bitten by boars at a housing estate in Kowloon. Boars have sharp teeth and large males are equipped with vicious tusks. Why are the boars coming to town? Garbage bins are a lure. The boars topple them in search of food, leaving rubbish strewn over pavements. “Pigs are creative — they’re one of the smartest animals,” says Wong. 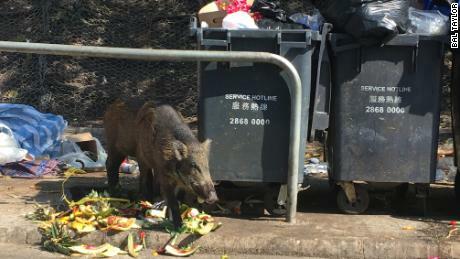 “Once they know it works, they will keep doing it.” Last year, a clip of a monster-sized boar raiding a dumpster in Hong Kong went viral on social media. He believes this reflects a cultural shift. As animal welfare has become a more prominent issue in Hong Kong, people are redefining themselves as animal lovers. Walsh says she has seen local workers feeding the three boars that live near her apartment complex. 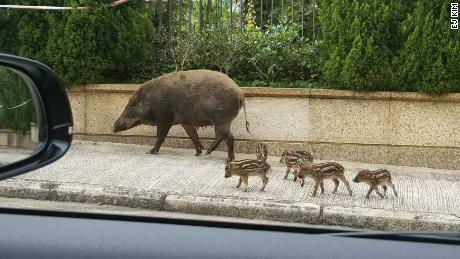 Veronique Che, an advocate with the Hong Kong Wild Boar Concern Group, believes that another factor is urban expansion. In the 1960s and 70s, the development of towns in the New Territories — Hong Kong’s northernmost region — led to the boars’ natural habitat being built over and converted to farmland, says Che. The government has considered some wacky solutions to the boar problem. One lawmaker suggested releasing natural predators into the wild but, as the AFCD points out, anything big enough to kill a wild boar — such as a lion or tiger — would threaten humans. Another official floated the idea of moving the boars to uninhabited islands — but that’s not practical because they are good swimmers, according to the AFCD. Culling has also been discussed. Two civilian hunting teams were previously authorized to shoot wild boars, but that was halted in 2017 due to concerns about animal welfare and public safety. Instead, the AFCD has launched a pilot program to capture “nuisance-causing wild pigs” and relocate them to remote areas. The boars are micro-chipped and some receive a collar equipped with a GPS tracker. Mature females are injected with a contraceptive that is effective for about five years, and the feasibility of surgical sterilization is also being explored. The government is also stepping up its public education campaigns and has commissioned research into boar-proof garbage bins. 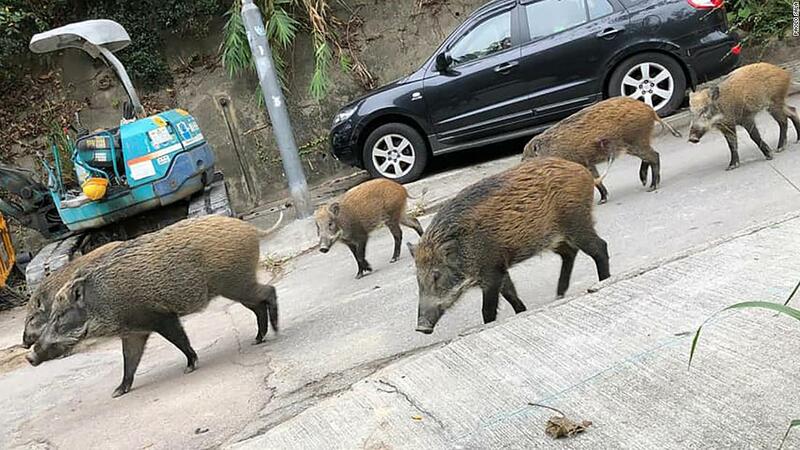 As the Chinese Year of the Pig starts this week, Hong Kong is hoping that its porcine residents won’t become an unmanageable problem in the 12 months ahead.